The tax bill signed in Dec 2017 represents the most significant tax changes in the United States in more than 30 years. It makes major changes to the U.S. tax code for both individuals and corporations. Here's is a summary of the changes that will affect taxes in — the new brackets, modified deductions and credits, corporate tax changes, and more. 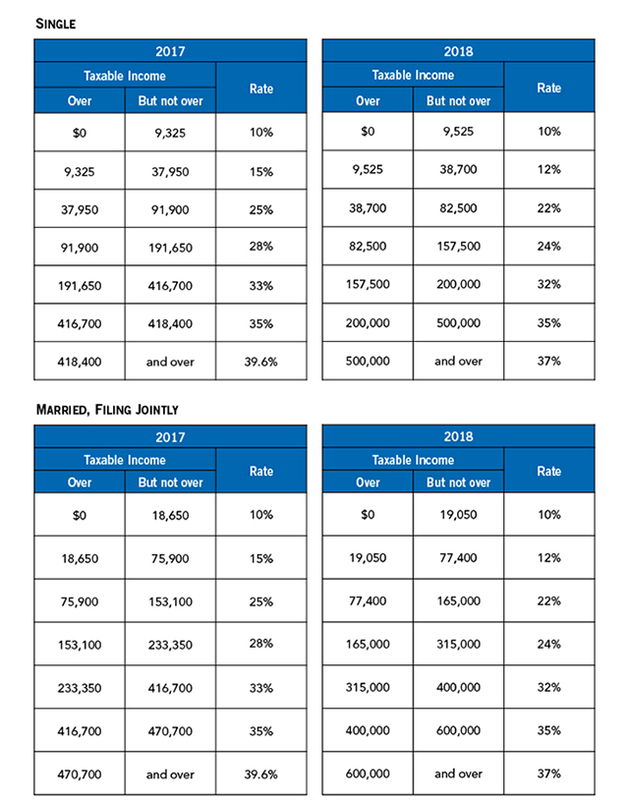 Previously, two single individuals who each earned a taxable income of $90,000 per year would both fall into the 25% bracket for singles. However, if they were to get married, their combined income of $180,000 would have pushed them them into the 28% bracket. Under the new brackets, they would fall into the 24% marginal tax bracket, regardless of whether they got married. The married-filing-jointly income thresholds are exactly double the single thresholds for all but the two highest tax brackets in the new tax law. In other words. Married couples earning more than $400,000, however, are still impacted. The personal exemption has been eliminated but the standard deduction has almost doubled for everyone. In the previous plan, a single filer would have been entitled to a $6,500 standard deduction and a $4,150 personal exemption in 2018, for a total of $10,650 in income exclusions. Under the new tax plan, they would just get a $12,000 standard deduction. The elimination of personal exemption could disproportionately affect larger families. The expanded Child Tax Credit, which is available for qualified children under age 17 offsets this loss. The bill doubles the credit from $1,000 to $2,000 and also increases the amount of the credit that is refundable to $1,400. There is about $2.6 trillion in U.S. corporations' foreign profits held overseas. The new tax law sets a one-time repatriation rate of 15.5% on cash and equivalent foreign-held assets and 8% on illiquid assets like equipment, payable over an eight-year period. This could be big news for companies like Apple, which has more than $200 billion parked overseas at the end of 2017 and a big benefit to the US economy.